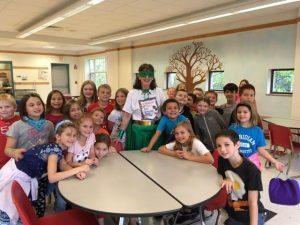 Rachel Schwab, RCS and ACES Guidance Counselor, visited with Royalston Community School students at lunch on October 4, 2018, dressed as a School Attendance Hero. Schwab, and Linda Jaskoviak, also a Guidance Counselor at ACES and RCS, are at RCS on Thursdays to present Classroom Guidance lessons, and to provide school counseling to students. During today’s Classroom Guidance lessons for all grades, students learned about the importance of attending school every day, unless you are sick, or have a doctor or dentist appointment. Students learned that Attendance H.E.R.O. stands for: Here at school, Everyday, Ready to Learn, On time for school. A fun time was had by all!